Full line of compact crushers and screeners brings new opportunities for customers in Canada and the U.S. The Rubble Master HS3500M compact tracked scalping screen. Rubble Master (RM) has acquired Northern Ireland-based screen manufacturer Maximus. Founded in 2004 and employing 120 people, Maximus will complement Rubble Master's existing range of products, helping to satisfy customers and support future growth. 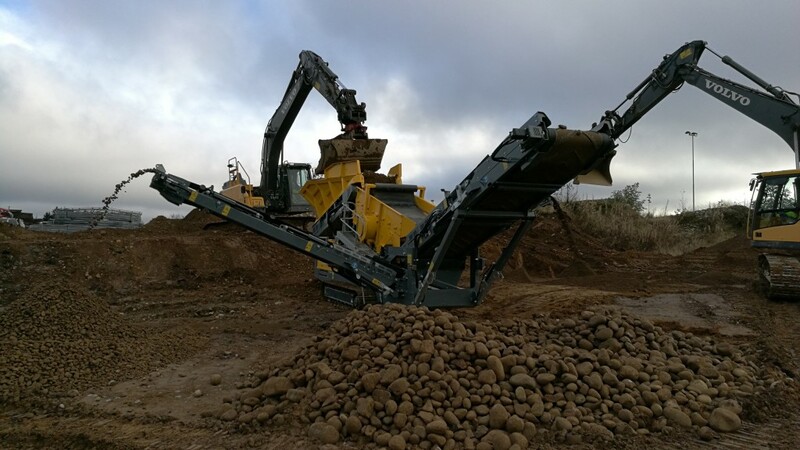 According to Rubble Master, for customers and dealers, this acquisition means a full line of crushing, recycling and screening products are now available with the same reliable, lifetime support and complete parts and service support customers have come to expect from their company. "This investment allows us to improve our product offering globally, and specifically for the U.S. and Canadian markets," said Gerald Hanisch, president and owner of Rubble Master. He says the venture is already driving new product developments and future growth. Initial results of the two companies' joint engineering and production capacities: the all-new RM HS3500M and RM HS5000M compact tracked scalping screens (shown above). These machines are already being nicknamed "Swiss-Army-Knife", because of their versatility to process a multitude of materials, including excavated C&D waste, asphalt slabs and millings, topsoil, mulch, gravel and more. "This now opens up synergies in many areas," commented Günther Weissenberger, Rubble Master CFO. "We will benefit from shared suppliers and economies of scale." At Bauma 2019, Rockster not only presented its diverse range of products, but also immersed the visitors in new fields of interest. Wolfgang Kormann, CEO of Rockster Recycler from Austria, is convinced that this trade fair really deserves to be called "The World's Leading Trade Fair for Construction Machinery". Washing equipment specialist McCloskey Washing Systems (MWS), along with their UK dealer MaxInnovate Ltd, held its first multi-spread demonstration event, at Monk Plant Hire (MPH) in Hockering, Norwich, UK on Wednesday 20th and Thursday 21st March, highlighting the power of the washing equipment working together. The demonstrations were an integral part of events tailored to familiarize both new and established dealers and customers with the versatility and productivity of MWS latest products. At bauma Terex Finlay unveiled the capabilities of OMNI by Terex, a new system that promises to help improve jobsite safety and efficiency in operating crushing and screening equipment. "Hauling is one of the most cost-intensive components of a typical mining or quarrying operation. In addition to fuel and labor, there's plenty of maintenance involved too. To ensure cost efficiency, a haul truck should carry as much payload as possible on every round. At Metso, we set out to tackle this challenge and designed a truck body that requires minimal maintenance while maximizing payload. The result is a lower operating cost per hauled ton," says Lars Skoog, Vice President, Mining Wear Lining & Screening, Metso. Metso is introducing the latest addition to the versatile MX Multi-Action cone crusher series at Bauma 2019. The MX3 enables improved crusher productivity and lower operating costs with a design optimized especially for mid-sized quarrying. Aggregates operators are always looking for ways to improve their efficiency and make more informed decisions in their planning processes. Many are adopting emerging technology as an added way to develop their operations, and the advent of drones is playing a large part. Volvo Construction Equipment's Electric Site project aims to test the world's first "emission-free" quarry by electrifying each transport stage, from excavation to primary crushing, and transport to secondary crushing. It uses both electric and autonomous Volvo CE prototype machines, plus new machine and fleet control systems and an entirely integrated real-time site management system. Together, these form a complete Electric Site solution. Volvo CE and its customer Skanska tested the viability of the Electric Site research project for 10 weeks at a Skanska's Vikan Kross quarry near Gothenburg, Sweden. Heavy Equipment Guide staff were on site to see the operation and learn about the results. At this year's bauma, Kleemann presents a comprehensive cross-section of its innovative product portfolio with a total of seven mobile crushing and screening plants. High-performance machines and environmentally-compatible solutions for natural stone and recycling applications will be presented. At the start of 2019, Kleemann was awarded two international design prizes: the iF DESIGN AWARD and the GOOD DESIGN Award for the jaw crusher MOBICAT MC 120 Z PRO and the screening plants of the EVO line. Innovative details for safe operation and simple handling impressed the jury members. Wet processing equipment manufacturer CDE is launching an innovative new range of technology solutions to enable customers to increase the efficiency of their plant, automate processes, and lower their operating costs. Since its founding in 2004, ROCKSTER has developed two patented systems for mobile crushers. At bauma 2019, the mobile impact crusher R1100DS will be displayed in the open area in front of the B2 Hall / Gate 7 (Booth No. 12B/2). The machine combines both innovative systems (DUPLEX and double-functional return / stockpile belt) and as of 2019, it will be equipped with a CAT C9.3B EUR5 engine. This will offer customers the latest state-of-the-art technology. The Telsmith 3244 Portable Plant provides the portable crushing producer consistent, reliable production, low mobilization costs, and the flexibility in a number of processing applications such as producing quarried stone, sand and gravel, and recycling. The 3244 primary jaw plant can be used alone or configured with other mobile plants to create a complete processing system in aggregates processing. Astec, Inc., an Astec Industries, Inc. company and manufacturer of state-of-the-art asphalt plants, will exhibit as part of the Astec Industries booth, stand number FS.1109/4, at bauma 2019. AGG1/World of Asphalt visitors received a first look at McCloskey International's new tracked radial stacker - the ST80T Radial - that allows operators to switch from tracked to wheel in minutes. Lars Engström, President of Sandvik Mining and Rock Technology, will leave Sandvik during 2019 after the appointment of a successor.